Pirates & Privateers : Hello! 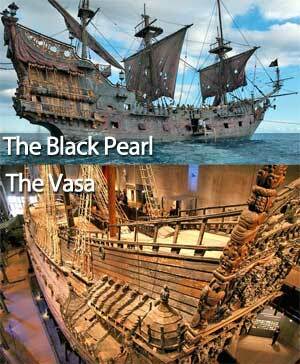 Can you tell me which style of ship is closest to the Black Pearl? Question of Jackrackam (03.29.2016): Hello! Can you tell me which style of ship is closest to the Black Pearl? A: The Black Pearl, from the movie Pirates of the Caribbean, like the Flying Dutchman, was partly inspired by Dutch flutes of the seventeenth century, and particularly in Vasa (or Wasa), a famous Swedish warship.